Emails on the go and syncing your calendar to your mobile devices are just part of our daily routines now in education. Now you are just a few clicks away with Google Apps for Education. Check out the latest links and tutorials added to our York GAFE Support Site this month below. A group of professional nature recordists from around the globe have collaborated to develop Nature Soundmap, an enjoyable and interactive way of exploring the natural sounds of our planet. Combining high-quality field recordings with the latest satellite imagery, the project brings together some of nature’s most beautiful, interesting and inspiring sounds. Here is David Kapuler's favorite and most popular post of the year, The Top 100 Sites/Apps of the year! Our online professional development program offers over 50 courses of live, web-based PD. 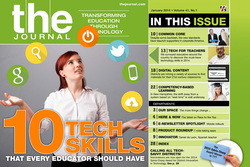 It focuses on the most important technology integration challenges facing teachers. Our Instructional Technology Team piloted this program for eight weeks with teachers across the country. During the last 15 years, we in education have moved at light speed in the area of educational technology. Whether you are involved in higher ed, secondary ed, elementary ed, or special ed, all of us find it difficult to catch up, keep up, and put up with fast-moving computer-based technology. Digital literacy, and other integrated topics, explained in a simple user friendly video. Vidtionary is a video dictionary. It defines and expresses words through images. It is suitable for language learners, both native speakers and students of English as another language (ESL or EAL). Vidtionary is also a good tool for teaching visual literacy and graphic design. QuickCast enables you to record 3 minute screencasts and upload and share them quickly and easily. Screencast and share tutorials, bug reports, design critiques to remote colleagues and clients. How Does the Number Tree Grow? Explore the best video lessons in education. We’ll find the right ones for you. From February 7-23, all eyes will be on Sochi, Russia, as it hosts the 2014 Olympic Winter Games. The Sochi Olympics marks the first time the Olympics have been held in Russia since the dissolution of the Soviet Union. This year, there will be 98 events held in 15 different sports, and some events, such as women’s ski jumping and ski half-pipe, will be held for the first time. Use this site to create a fake Twitter conversation, adding as little or as much details as desired. Demonstrate properly social networking etiquette or explore what a Twitter conversation would be like between two (or more) people who lived before the age of Twitter. Introducing CC.BetterLesson — a brand new, free resource from the BetterLesson team featuring the highest quality Common Core-aligned lessons created through our Master Teacher Project. Featuring lessons designed by our very own Beth McKenna.